Insulated glass , also called Insulated Glazing (IG), more commonly known as double glazing (or double-pane, and increasingly triple glazing/pane) are double or triple glass window panes separated by an air or other gas filled space to reduce heat transfer across a part of the building envelope. Insulated Glass Units(IGU) are manufactured with glass in range of thickness from 3 mm to 10 mm or more in special applications. Laminated or tempered glass may also be used as part of the construction. Most units are manufactured with the same thickness of glass used on both panes,but special applications such as acoustic attenuation or security may require wide ranges of thicknesses to be incorporated in the same unit. To reduce shear effects on the sealed unit (a major cause of premature failure), manufacturers use a rule of thumb that permits a difference of 1 mm between the thickness of the panes of glass used in the unit and still maintain the warranty for the unit.For example, a unit may be ordered with a 4 mm pane on the exterior and a 3 mm pane on the interior. These variations are allowed for architectural and cost reasons. Other combinations can be specified and produced but the manufacturer may reserve the right to limit the term of the warranty or refuse to warranty the unit altogether. Due resistance: desiccant keeps the dryness inside the spacer and resists forming of due. 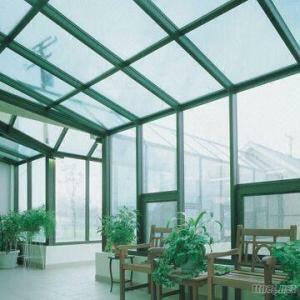 ECO Insulating Glass,Insulated Glass,PB HIKING INSULATED GLASS!